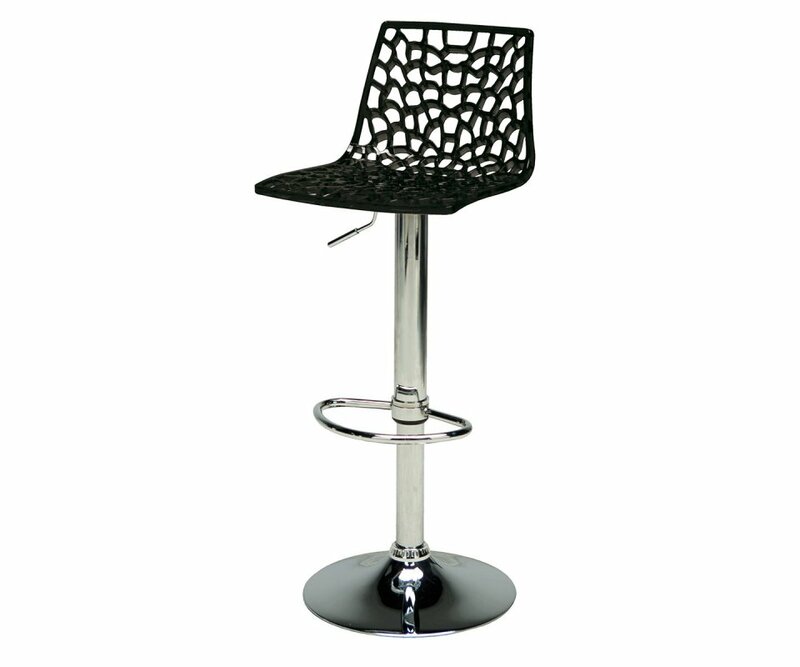 Barstools have never looked better than this UpOn Spider Gas design. The lacy web design in the chair creates a dramatic focal point at your pub table, restaurant/bar, or home entertainment area. These chairs come in Clear Crystal, Solid Glossy White or Solid Glossy Black color choices. With these colors and the eclectic style, you can incorporate the chairs into any color or style of home décor. 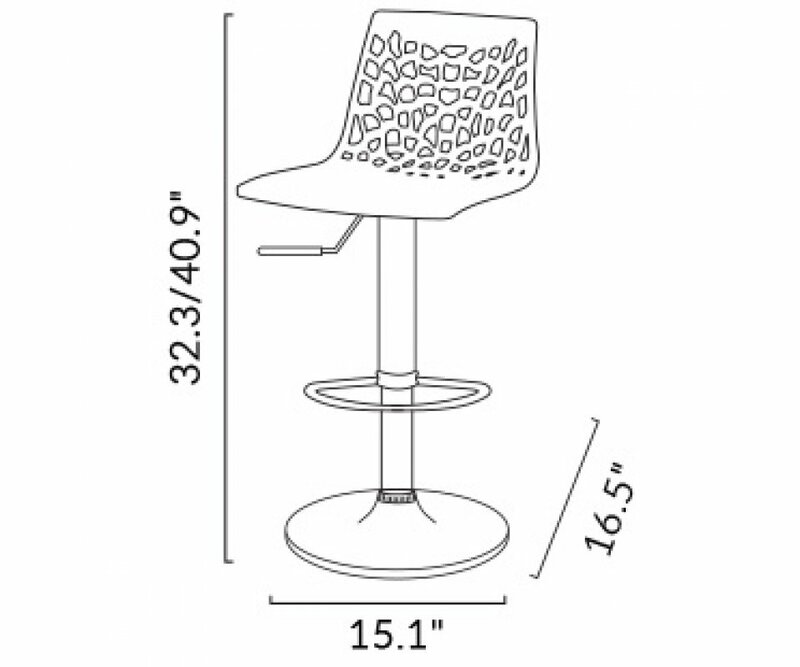 The chair tops are molded in one piece from polycarbonate, which is stronger, clearer, and more lightweight than acrylic and the adjustable stand base is chromed steel. They are scratch resistant, won’t fade, they’re waterproof and easy to clean! 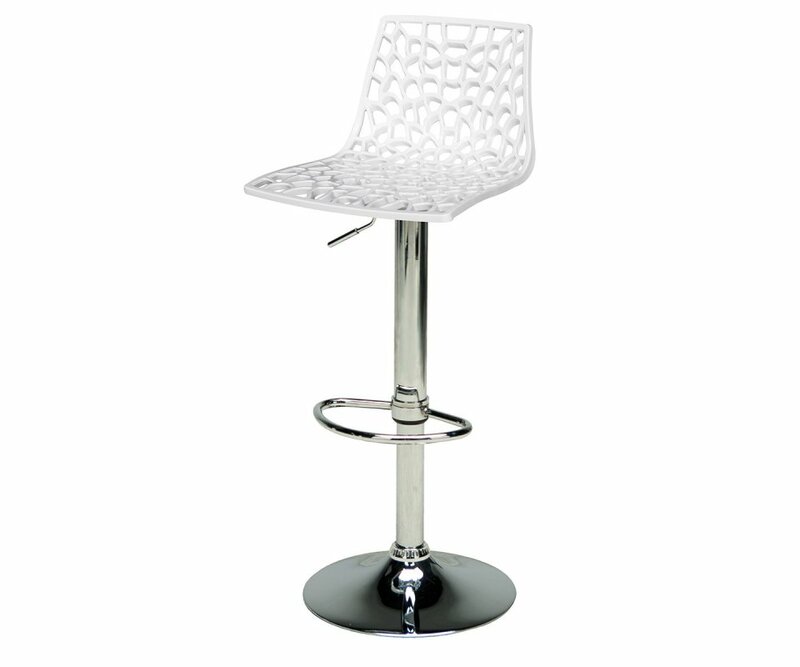 Your friends and family will love the Spider Gas barstools! Like a true femme fatale, our UpOn Femme Fatale side chair has curves in all the right places! The back and seat contour to fit for luxurious comfort, and the chair looks and feels liquid-y smooth and sleek. This is a chair that will take center stage in your dining room or anywhere you just have to.. The design in this beautiful Italian-made UpOn Dune side chair is reminiscent of the effect of wind over sand dunes in the Sahara desert, and will add a flowing abstract detail to your home décor. Paired with a solid wood or glass table, you will have the basics for creating the perfect design.. UpOn Hypnotic is mesmerizing in its beauty. It’s made from transparent polycarbonate, and formed into a beautiful quilted pattern, and designed with carved legs and contour-molded back and seat for extra comfort. It comes in crystal clear and translucent light smoked gray, so it will go with a..
Our Lollipop Mite chairs are designed with a smooth, contoured bucket seat that’s made for comfort and back support. The legs are chromed steel, designed for strength and supporting adult weights, with a durable, solid glossy polycarbonate chair that is resistant to scratching or fading, is waterpro..
Abstract lines wave along this distinctive chair surface. The chair is set on round chromed steel legs that give it a contemporary style.This transparent chair will be compatible with any table type, from hardwood top glass, wicker or ceramic tile. It is neutral toned to work with any color-sc.. The UpOn Lollipop Slide Chair gets its name from the easy sliding, runner style, steel-rod chromed base. This chair is designed for beauty, comfort and ease of movement. It comes in Crystal Clear or Solid Glossy Black color choices, and will enhance your dining area, restaurant or café business, or .. The UpOn Groove Slide side chair is very groovy indeed! The lacy-patterned chair is made from polycarbonate, molded in a new process that allows for the intricacy of detail, resulting in chair art forms that set the style of your dining room, restaurant seating, or outdoor café. This design co.. The softly waving pattern of the UpOn Calima Slide chair adds a unique, contemporary element to your dining area, kitchen nook, bistro café or restaurant. Even a simple wood or glass table will suddenly take on new elegance with these transparent chairs.They are made from crystal clear polycarbonate.. The UpOn Groove C Legs chair combines beautiful vintage artistry with modern, contemporary function. The chair is made in a breakthrough process that gas-molds polycarbonate into virtually any shape with any detail! The resulting product is extremely strong, lightweight, and beautiful! This style i.. The delicacy of the spider web meets the strength of polycarbonate in this intricately patterned bar stool. The revolutionary gas-mold process allows for the creation of furniture that is strong, crystal clear, lightweight, and with design elements that were not possible to achieve before! The..
Get the same wonderful pattern as our clear, polycarbonate Gruvyer chair in this polypropylene version that allows us to offer brilliant shades of color for your décor! Your designer-chic chairs will be the focal point of your dining area, outdoor entertaining area, restaurant or café! They are avai.. The UpOn Little Rock side chair is the perfect choice for everything from home dining to restaurant or bistro café seating, and can even be kept outdoors! They come in crystal clear and light smoked gray, and have a modern eclectic look that fits in any color-scheme and in any themed space. Up.. The UpOn Gruvyer side chair gives the effect of a net or web pattern that will make your dining area dramatic and eye-catching when friends and family gather. They are made from a new technique that gas-molds clear polycarbonate into unusual shapes and patterns that couldn’t be created before now in..
Get the same wonderful pattern as Grandsoleil's clear, polycarbonate Gruvyer Armchair in this polypropylene version that allows us to offer brilliant shades of color for your décor! Your designer-chic chairs will be the focal point of your dining area, outdoor entertaining area, restaurant or café! .. The Casa Mia Kids Playhouse by Grandsoliel is a wonderful choice for indoor or outdoor play for children from ages 3-12! It’s bright and friendly, with blue shingled roof, red window and door accents, and multi-colored flowers scattered in a garden effect on the lower exterior of the playhouse! The ..